It’s the must-see movie of the month, especially if you happen to love Disney movies (and who doesn’t?). But Incredibles 2 now comes with a health warning that all parents need to know. The movie opened on 14 June in Australian cinemas just in time for school holidays. And it may trigger seizures in children and others with photosensitive epilepsy or other photosensitivities. 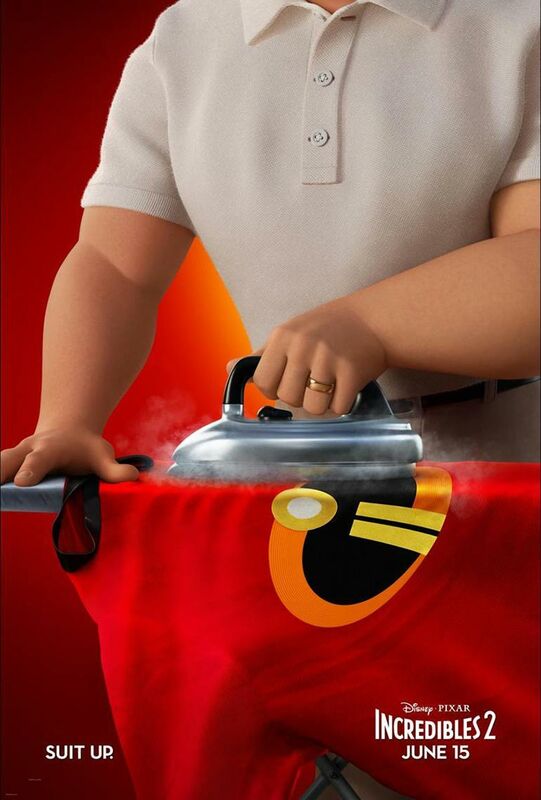 It’s been a long wait for the sequel to the popular 2010 movie Incredibles. Like many of us, Virginia student Veronica Lewis was more than excited to take in the new flick. But after seeing the film – which she says is incredible – she wants to warn viewers about the excessive use of strobe lights/white flashing lights. Veronica headed to Twitter and her personal blog to voice her concerns about the use of strobe lights, which may “cause issues for people with epilepsy, migraines, and chronic illness”. As Veronica explains, “There are at least five scenes throughout the movie, all of which feature the villain, that use bright white flashing/strobe lights for more than fifteen seconds.”. She says one scene has more than 90 seconds of “continuous strobing lights”. In 1997, an episode of “Pokémon” with flashing lights that aired in Japan sent nearly 700 children to the hospital. The issue, according to Veronica, is that people can be sensitive to flashing and strobing lights. 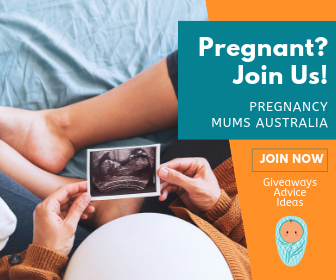 She mentions people with “photosensitive epilepsy, migraines, vision impairment, seizure conditions, vertigo (specifically flicker vertigo), autism, ADHD and PTSD”. And Epilepsy Foundation in the United States has since issued its own warning to people with epilepsy about the Incredible 2 movie. “We stand with our epilepsy warriors and their families as they voice their concerns about the movie and appreciate the efforts some theaters have already made to post warning signs for people waiting to see the movie,” the Epilepsy Foundation says. 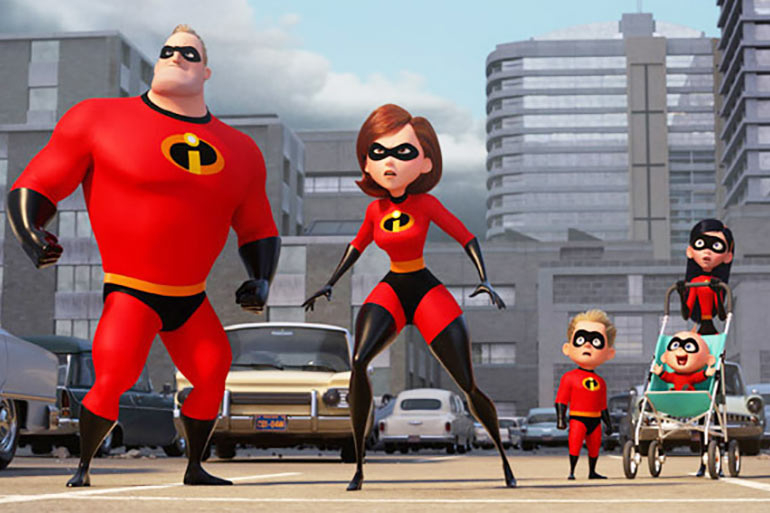 “To avoid any serious medical incidents, the Epilepsy Foundation is requesting that Disney Pixar post a warning on all its digital properties, including relevant websites and social media channels, about what has been described as “flashing” and “strobe” lights in its “Incredibles 2” movie. Other parents also chimed in with their experiences. “We didn’t know about this warning until after watching the movie but Carter closed his eyes and covered his face with his shirt during the flashing parts. We’ve had many conversations about what to do during these types of situations and I’m thankful he takes precautions seriously. We’re thankful the movie didn’t send him into a seizure. Praying for the families that were affected – breaks my heart! You NEVER know when the next one will begin,” one mum posted on Facebook. Disney soon caught wind of the public’s concern and wasted no time going into damage control. 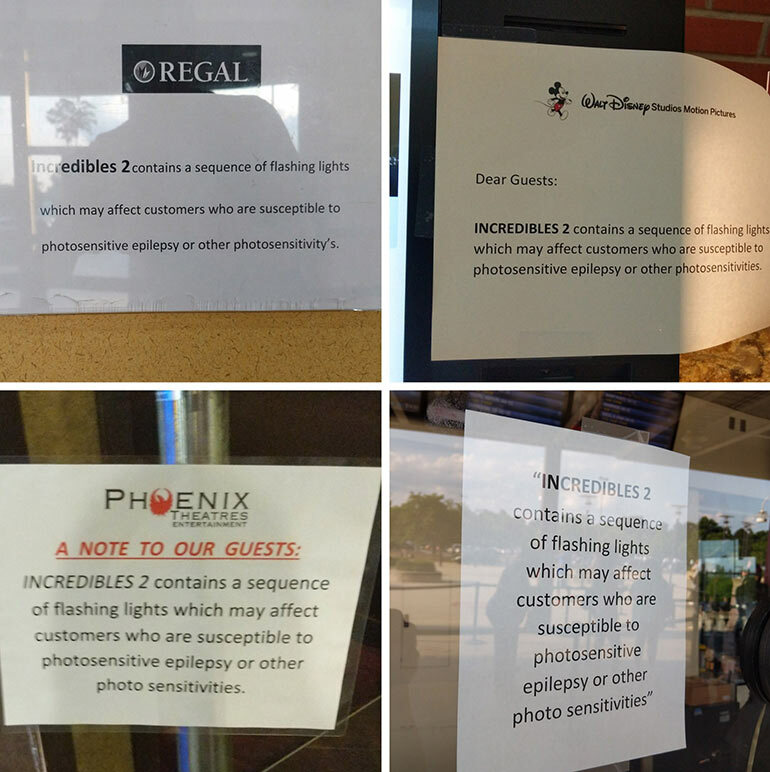 Many theatres now have signs in place, warning customers about the scenes. 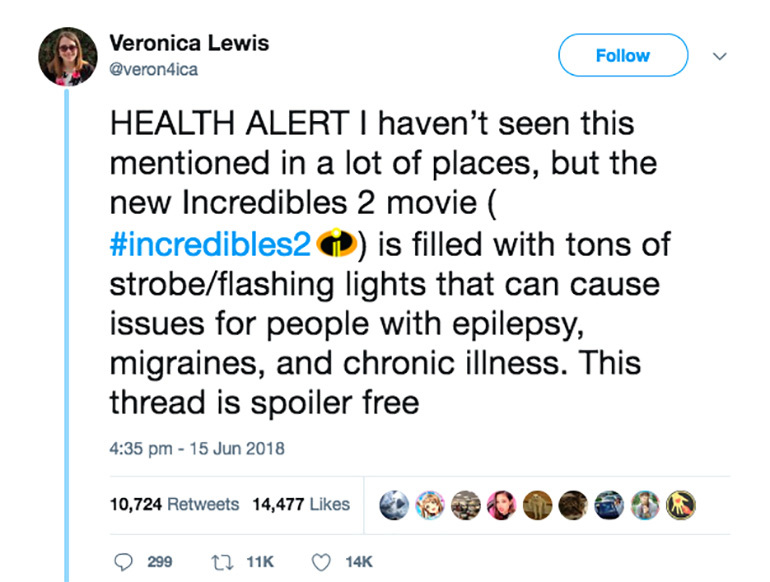 The warning reads: “INCREDIBLES 2 contains a sequence of flashing lights which may affect customers who are susceptible to photosensitive epilepsy or other photo sensitivities”. If you have a child with epilepsy or sensitivity to flashing lights, keep this warning in mind. And let us know if you spot any warning signs at you local cinema. This isn’t the first time a kid’s movie has faced scrutiny this year. Peter Rabbit faced serious backlash for making light of food allergies while Show Dogs was recently scrutinised for a very concerning message about child grooming.